An observation - I found some screw in LED bulbs in a big promotion at Costco - at a good price. I wanted some for some household fixtures I have on dimmers, and of course I had to try them on tanks. They are 8 watts, 490 lumens, and supposedly good for 25,000 hours. The lumens aren't even close to ideal for plants, but I am going to see if they keep the Anubias and Bolbitis alive. I can say that what they do to lampeye killie eyes is astonishing. 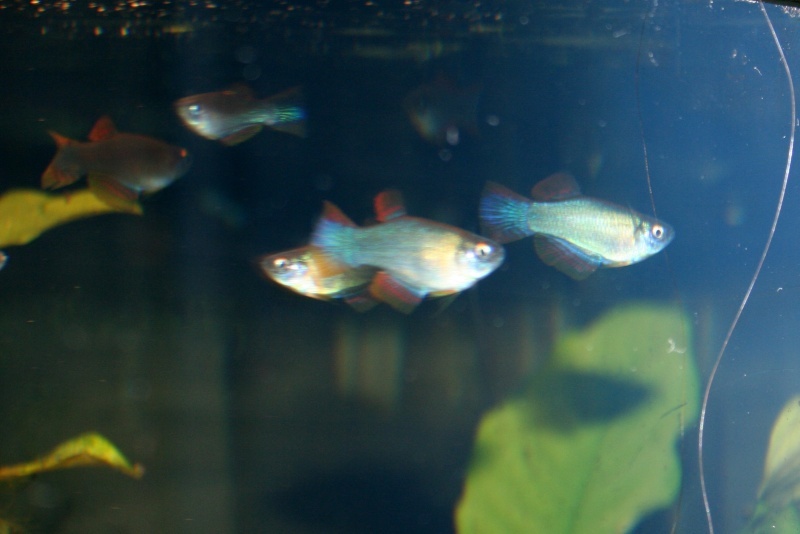 I have a geographically impossible tank of Poropanchax normani adults and juvies in with Pseudomugil cf paskei blue eye rainbows, and the fish look positively electric. If you have blue eyed fish, you should see this effect! They would look very good in a larger tank aquascaped with planting under a higher lumen light, and with open areas and lampeyes under one of these little spots. I need to bring over one of my LED fixtures! the LED fixture you are talking about have 4 x 3W LEDS running at 2 watts in them. if you have it close to the tank it might even be too much. Most of the time the beams are too focused causing a lot more light but just a smaller area of coverage. We did a basic test at Builu's today, 29W of LED were almost similiar to 2x t5HO bulbs. FYI, Access Electronics has cheap lights similiar to what you have. Running around $8-12 each they may work well and cheap for a rail of light sockets. There is an approach difference here. All my tanks are planted, but I don't care much about plants. They are secondary accessories to the fish for me. I'm trying one LED spot for a 20 gallon to see if the plants can survive, as the spot creates really interesting effects and brings out fish colours. If my plants grow well, that's fine. But I don't have the perspective of the planted tank keeper who would run a row of these lights over a tank - that would kill the colours of my rainforest fishes... I want shadows and dim areas in all my tanks. It sounds very interesting Gary. I see what you mean. 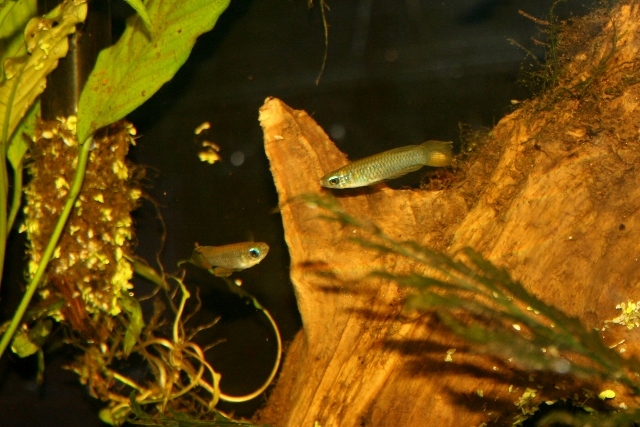 I really love the fixture Caoder made for me, but... the colours of the sparkling gouramis seem washed out now when they are out in the open. The fluorescence that I had with very low light, is gone. Can you post pictures of the light as well as how it lights your tank? I buy LEDs on ebay, from China. 3-4x cheaper. 4 strips (2sets), result: anubias grow really impressive, some other plants doing ok. I appreciate the link to the Chinese light strips, but that`s not the direction I`m going in here. What I have bought is a screw in bulb - for years now I have run my tanks on 23w spiral fluorescents, one per tank, and have had excellent plant growth with them. I use pendant lamps hanging down from above. The spots I bought lack lumens, but provide an intensity I quite like at 8w each, using existing fixtures. I quite like having my tank lights suspended above the tanks, as that is a lot less trouble than having a top of the tank light fixture. I haven`t been impressed with aquarium LEDs so far, due to the cost outlay and the brightness - I don`t care if they grow corals or stem plants, as neither have a place in my set-ups. I run mainly Crypts, Anubias, Bolbitis and java ferns, and all have been thriving under my 23w spirals. I wanted to point out another alternative that may be awful for plants (we will see - if so, I will supplement with spirals) but that is fantastic for what it does to the colours of highly reflective fish species. We`re talking strictly what the plant gang call a low-tech tank set up - my technology always goes to the fish. So, instead of adding this 'accent' light, I understand you replaced your light saving bulb with this LED bulb? I got the same effect with a light I 'saved' from a broken tank. It is a mixed blue and white light meant for a 7 gallon tank but placed on a 29 (much more depth). The colours of my sparkling gouramis were amazing! What I have done on one tank is use the LED bulb to accent one side of the tank, and a more general light to get the other third of the 40 gallon.